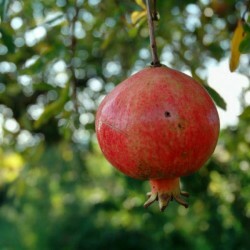 Funky, oddly-shaped, thirst-quenching fruit and beautiful flowers define the pomegranate. This plant, long used by humans, is native to region from Iran to northern India including areas of the Himalayas. 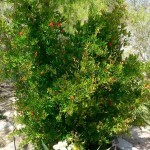 It is an evergreen large shrub to small tree. The leaves are held opposite each other on mostly spiny stems and are lance-shaped to oblong. Brilliantly hued blooms are produced at the ends of the branches singly or in clusters throughout the summer. 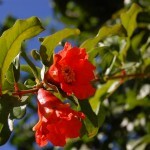 Many orange-red, crinkled petals are held close together in a vase-shaped, fleshy, almost woody, fused group of outer petals. Fruits are round and flattened on the ends with prominent remains of the flower at the bottom and are yellow to pink to red. 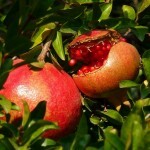 The fruit skin is hard and leathery surrounding many seeds which are coated in juicy, ruby-tinted sacs. Germination 1. Soak overnight in warm water and Stratify seeds in moist vermiculite for 30 days at +2-+4 degrees Celsius in air tight container or bag. You can use a very clean soil as well. 2. 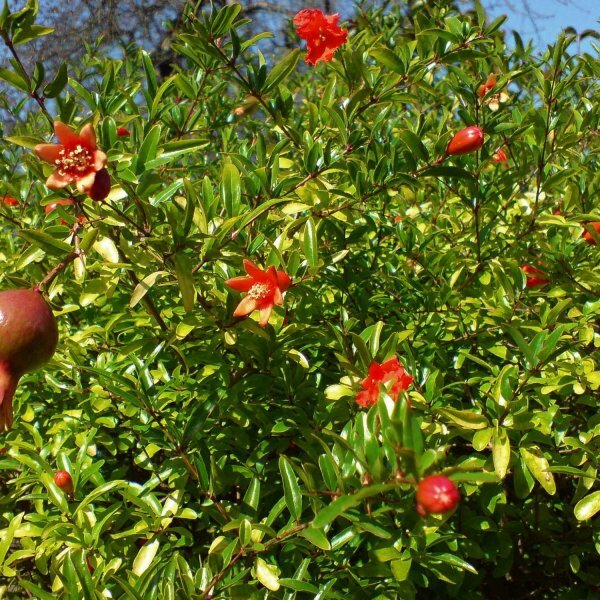 Prepare a pot for each pomegranate seed. Fill 4-inch plastic pots with a mixture of 3 parts potting soil, 2 parts compost and 1 part perlite. Pour 1/2 cup of water into each pot. Press the soil to express the excess moisture. 3. Sow one pomegranate seed in each pot to a depth equal to the length of the seed. For instance, a seed that's a quarter inch long requires a planting depth of one-quarter inch. 4. Place the pots on a propagation mat set to 75 degrees Fahrenheit (24-25 degrees Celsius). Turn off the propagation mat at night to mimic the natural warming and cooling of the soil outdoors. Keep the soil lightly moist to a depth of 1 inch at all times. 5. Watch for germination in 10 to 15 days. Remove the pots from the propagation mat once the seedlings produce a set of mature leaves. Move the pots outdoors to a spot with partial shade during the afternoon. 6. 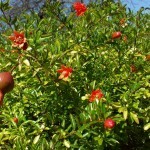 Transplant the pomegranates into large pots in three months. Move them into a sunny, permanent bed once the pomegranates grow to 12 inches in height.